QUICK Delivery - Available Immediately - Furnished! 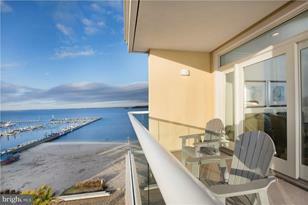 Experience Pool & Bay View condos & Ocean Views from the rooftop plaza. This Model offers an open floor plan, insulated doors and windows, granite countertops and a standard appliance package. Enjoy your own private balcony on the Southside with views of the Marina and Bay. Enjoy the rooftop pool. Immerse yourself in a resort lifestyle. Relax by the indoor saltwater pool (fee), enjoy the fitness center (fee), and the Plaza Courtyard featuring a fire pit, grilling area, water fountain, multiple sitting and lounging areas. Direct Access to Bay Front amenities including Kayak, Stand-Up Paddle, Jet Ski & Boat Rentals, reduced slip fee rentals at adjacent Rehoboth Bay Marina. Driving Directions: South on Rt 1 from Rehoboth Beach. Condos are adjacent to Hyatt Place Hotel at the corner of Dickinson and Coastal Hwy. Sales center is located on the ground floor, next to the main entrance of The Hyatt Place hotel. Living Area: 1,050 Sq. Ft.
1301 Coastal Highway #456, Dewey Beach, DE 19971 (MLS# 1001566156) is a Condo property that was sold at $629,000 on August 17, 2018. Want to learn more about 1301 Coastal Highway #456? Do you have questions about finding other Condo real estate for sale in Dewey Beach? You can browse all Dewey Beach real estate or contact a Coldwell Banker agent to request more information.